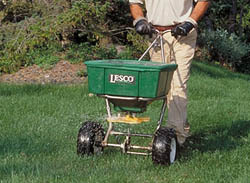 With the growing season in full swing it is time to fertilize your lawn. Remember unless you have winter turf grass (ex. fescue) this is the last feeding for the year. Do not fertilize in the fall or winter, you will only feed the winter weeds. Also September is when pre emergent should be applied to stop the winter weeds. We can take care of all of this for you so you can enjoy the rest of your summer and your lawn. Call us today for a completely free estimate!! Previous PostUGA Extension ServiceNext PostIt’s time to fertilize your lawn!